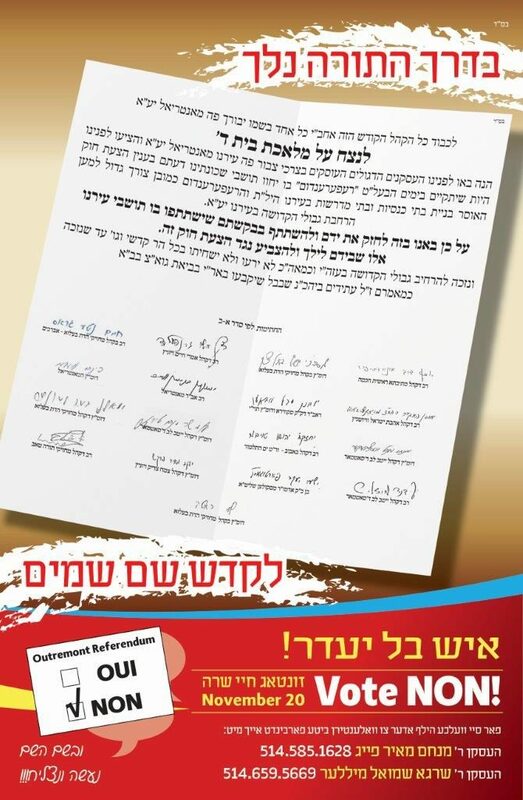 Posters sent by the askanim in Montreal. A controversial zoning law in the Montreal neighborhood of Outremont that could stifle growth of the area’s Orthodox community will be decided upon by a public vote this coming Sunday. Should the measure pass, it will effectively ban the construction of all “houses of worship” in the area. The measure was approved by the town’s council last May, but in early September activists opposing the changes were successful in obtaining enough signatures from residents to put the law up for a referendum. Many activists and observers have expressed alarm over the bylaw, identifying it as a thinly veiled attempt to limit the Orthodox community’s exponential growth in the area, despite claims by local officials that the move is intended to increase retail businesses in the borough. Mayer Feig is part of a team of community activists who have been heavily involved in efforts to defeat the bylaw. Outremont is an upscale neighborhood of Montreal that is home to many of the city’s prominent political, business and cultural figures and is mainly French-speaking. It has also grown into a center of Orthodox life. Of the borough’s 25,000 residents, one quarter of them are Orthodox, mostly Chassidim. However, the district contains only four shuls. For some time, houses of worship have been restricted from operating on residential streets; a string of by-laws passed since 1999 has slowly blocked construction on various commercial thoroughfares as well. The present proposal would block efforts to build on the last street open to construction of new shuls. Mr. Feig said that while parties in favor of the law have carried out an aggressive campaign, he and others in opposition choose to take a lower key approach. Canadian law does permit limits to be placed on the construction of houses of worship, but the Supreme Court has ruled that these laws must not be “onerous” to religious groups. In recent years, retail shopping has decreased in Outremont, which many observers associate with increased use of the internet for purchasing. The town’s mayor, Marie Cinq-Mars, has said that she believes allowing for additional houses of worship to exist between stores will further hinder the local economy. Opponents say the connection between shuls and economic troubles is undocumented, and call the argument an excuse to curb further influx of Orthodox Jews to the neighborhood. Last Sunday, 22 percent of eligible voters participated in an early vote. This coming Sunday is the date of the official referendum. This article appeared in print on page 14 of the November 16th, 2016 edition of Hamodia.